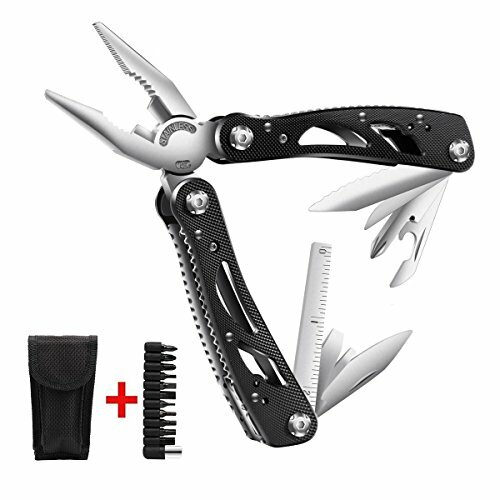 MAIN TOOL:The multitools includes pliers, wire cut, knife,screwdriver, file, serrated knife, flathead screwdriver, open cans,bottle opener Perfect for quick fix-it tasks while on the road, camping,or fishing. PORTABLE & EASY TO CARRY:This is all-in-one multipurpose tool and you'll want to take it everywhere with you. The multitool sheath lets you carry it on the belt,comes with free sheath and 11 attachable bits. DURABLE STAINLESS STEEL:Made of stainless steel materials after quench hardening treatment and via exquisite craftsmanship,the tool is durable,wear resistant and with comfortable grip. SAFE AND EASY TO USE:All of the extra tools locks into place when fully deployed and must be manually unlocked to fold away. This provides a much safer user experience. Also, all of the tools are accessible while the multi tool is in its folded or closed position, mimicking the functionality of a pocket knife. PURCHASE WITHOUT WORRY: Reliable,Easy-to-Access Tools Keep You Prepared. Very Useful, Good to have on hand whenever doing projects.30days money back guarantee ,100% High-Quality & Friendly Service and 24-hours Email Response, if you have any problem, please email us freely. If you have any questions about this product by Epartswide, contact us by completing and submitting the form below. If you are looking for a specif part number, please include it with your message.